In this long poem, published in honor of the poet’s 90th year, Ray Obermayr offers a candid, humorous, and poignant look at what to expect when you reach your ninth decade. 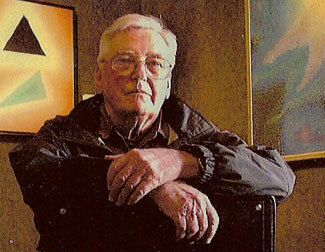 As a poet and painter and former college professor of art, Ray opened a show of new paintings in the fall of 2012 at Idaho State University, titled simply “90 Years.” This chapbook was brought out in time for that show, and in addition to the cover art, includes images of four paintings from the show. Born in Milwaukee in 1922, Ray Obermayr is a WWII veteran of the Normandy Invasion. After the war, he studied in Paris, and later taught in Illinois, where he became a mentor to the young Edward Dorn, and later encouraged Dorn to go to Black Mountain College in North Carolina to study with Charles Olson, Robert Creeley, and other innovative writers and artists. The two remained lifelong friends.Ray moved in the 1950s to teach at Idaho State College in Pocatello, where he mentored many other artists over several decades. A cultural rebel from the get-go, Ray was instrumental in encouraging Ed Dorn to move to Pocatello to teach for a time in 1961. In 1963, Dorn launched the legendary literary magazine Wild Dog, which lasted several years and 22 issues under several editors, moving from Pocatello to Salt Lake City to San Francisco, and featuring Ray’s art on several covers. Ray began writing poetry later in life. Two of his previous chapbooks were published by Limberlost Press, Double You Double You Too (1991, long out of print) and Too Much Is Just Enough (2002; currently still available on this website). Time’s Up? touches on the fragility of life, the radiance of art, and the enduring power of love.